Daniel Burton at the South Pole. Photo from http://epicsouthpole.blogspot.com. 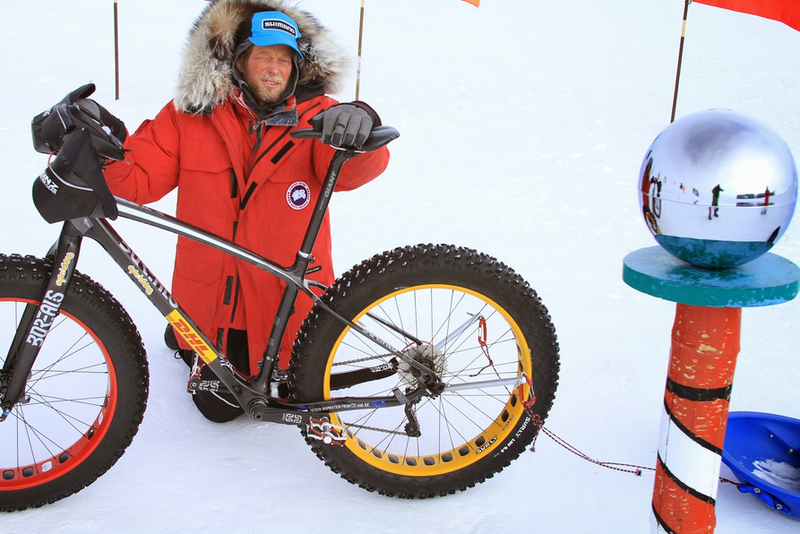 This year brought a new landmark in both fat biking and Antarctic exploration with not just one, but three successful cycling expeditions from the Antarctic coast to the South Pole. Each one was achieved in a different style that has brought inevitable squabbling about the details, but each one stands outright as an impressive achievement and a first in unique ways. British endurance cyclist Maria Leijerstam was the first to arrive at the South Pole on Dec. 26, spending a speedy ten days riding her custom tricycle on the 400-mile Leverett route in a supported expedition. Spaniard Juan Menendez Granados, who used a combination of skis and a fat bike, arrived the South Pole on Jan. 17 in a solo, unassisted and unsupported expedition, traveling 700 miles in 46 days from Hercules Inlet. Granados was determined to pull all his food, fuel and gear from the start to the end, even after the trip took longer than expected and he began to run low on supplies. For the final days of the journey, Granados survived on a mix of leftover nuts, cocoa powder and sunflower oil, while traveling 15 hours each day and sleeping only four to five hours. During his 700-mile journey across the frozen continent, Burton leveraged an impressive amount of grit and determination, proving that cliched mantra that “you can do anything you set your mind to.” Now, with that achievement behind him, he plans to go back to focusing on his family and business, as well as launching a foundation to donate mountain bikes to teenagers who demonstrate a strong interest in using them. Since he returned to Utah, Burton has come out publicly with criticism about the number of miles Granados apparently skied while dragging his fat bike behind him in a sled. Based on tracks in the snow and reports from ALE, the Antarctic expedition provider, Burton estimated Granados only rode about 120 nautical miles of more than 650. Burton is quick to acknowledge that he also didn’t ride his bike the entire distance — soft snow, high winds, and whiteout conditions sometimes necessitated pushing his bike, which is a common practice in winter cycling. Traveling on skis with a bike in a sled has less precedence, and is bound to be controversial, especially when the transitions between cycling and skiing are more complicated than simply stepping off a bike and walking with it for a while. Leijerstam, on the other hand, claimed she “pedaled every meter” of her route on her tricycle, and never had to tow or push it at any point. Burton said when he first started out, there was thick, soft snow on top of the surface crust. He would push most of the day and make ten miles or less. 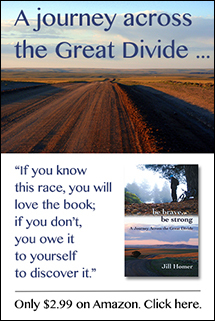 As time went on, sun hardened the fresh snow, and Burton would work to the limits of his abilities to pedal about one-tenth of a mile, stop to catch his breath, and try pedaling again. Toward the end, when Granados began to run out of food, his pace slowed considerably. At that point, Burton was logging more miles per day, and occasionally stopped within sight of Granados’ camp. When asked whether he ever attempted to pass Granados, Burton said, “Just before I was going to make my move, the weather got me. First, we had a couple of days of whiteout with soft snow. It was hard for me to follow the truck tracks Juan and I were following, and going outside of the truck tracks was more difficult, and so I was worth it to me to do everything I could to follow the tracks. With no contrast, I could not see the tracks and would get off of them a lot. At this point, Burton ran low on food himself. He had eaten all of his snack foods — Honey Stinger Waffles and Sport Beans — and was limited to three 500-calorie meals per day. He said he could only squeeze about 11 miles out of a meal before he had to quit pedaling because he felt so dizzy. Burton’s trip was a “solo, assisted” trip, meaning he received several supply drops from ALE. The eleventh-hour food delivery from Hannah, as well as a delivery of a new wheel in a scheduled supply cache after Burton’s hub on his real wheel failed, were part of this assistance, and by Antarctic record-keeping definitions do not change the status of his trip. I also asked Burton something I have been very curious about for years — whether, in his opinion, a bicycle is an efficient vehicle for Antarctic use. In many cases of winter travel on a compacted surface, bicycles provide advantages that no other form of human-powered travel can match. But I wondered if the combination of challenges in Antarctica — high winds, whiteouts, sasturgi, wind-drifted power, lack of compacted trail, remoteness, and extreme cold, would render a bicycle more of a liability than anything. Learn more about Burton’s expedition and new foundation at his Web site, or visit his GoFundMe Page to support future projects.